Close Grain: RFC: What To Do With Green Apple Wood? This is a Request For Comments. Your input is requested at the end! Doe Orchards' old John Deere nestled in the rows. 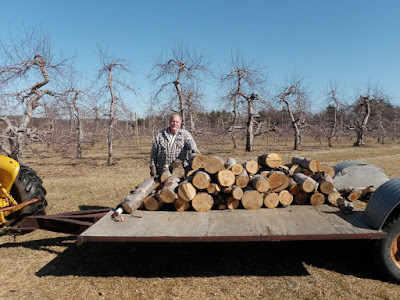 This post by Kari Hultman put the bug in my ear about getting some apple wood. 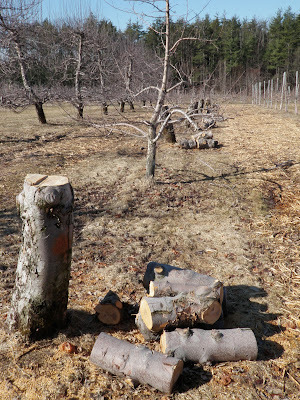 I had noticed a sign down the road at Doe Orchards in Harvard, MA, selling apple cuttings for firewood. I called them and left a message to see if they had any larger uncut wood for woodworking. Larry Doe called me back to say they did have some bigger pieces, but it was all green. I told him that's fine, since I do green woodworking. I told him I'd stop by Saturday. Looking at the weather report, Saturday's not going to be very nice. 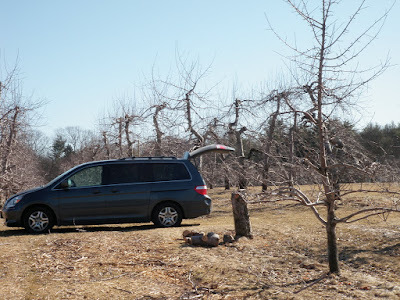 Today, however, is beautiful, so I used up a vacation day and headed over there, where Larry and Mark Dodd were clearing sections of red delicious and cortland trees. Larry pointed me in the direction of the red delicious. He said the long stumps were still in the ground; he uses the leverage to pull out the root ball. 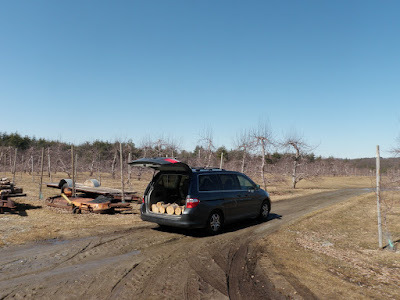 Interestingly, he mentioned that growers were moving away from larger diameter apple trees such as these, so in 10 or 15 years it might not possible to find this wood. 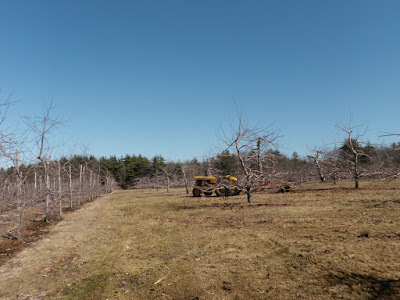 The red delicious row, with a half dozen trees being cleared. Loading up the van. A new definition for "Pick your own!" These trees were all cut in December, so the wood is not totally green. I picked pieces that were 8-11" diameter, with the clearest sections I could find. One load about ready. I limit it to one layer so I don't damage the suspension or get stuck. Each chunk is roughly 30 lbs. I still have snowshoes piled in the seats! 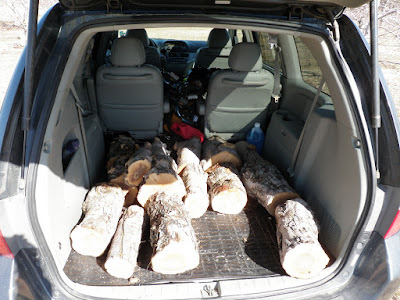 While I went home to unload, Larry and Mark loaded their trailer with the cortland wood. It was larger and clearer. The red delicious was much more gnarled. Mark Dodd with the load of cortland. I picked out the largest diameter, longest clear sections of cortland after they hauled it out of the field. I paid Larry for a load of firewood and headed home. Stacked at home, cortland in front, red delicious with darker heartwood in back. While we're at it, some cedar from the neighbor's house across the street. I think this was a shrub that got seriously overgrown. Closeup of cortland, showing the fine end checking exhibited by all the pieces. 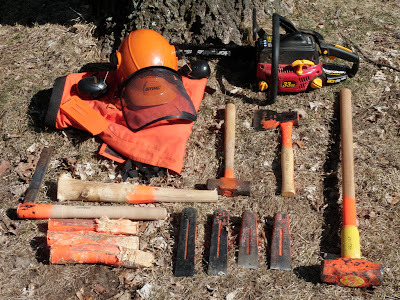 My lumberjack tools. I've split an 8'-long, 20"-diameter oak with these wedges and sledges (I'll have to post that video some time). The items at the lower left may not be familiar. From bottom, three birch gluts to hold open a split; a froe from Drew Langsner, a modern version of an ancient riving tool; and a hickory sapling club for driving the froe. The chainsaw is not really big enough for this kind of work. I also have a Shopsmith bandsaw in the basement. For anyone contemplating using a chainsaw, first contemplate this OSHA diagram of chainsaw injury locations. Ouch! Yes, by all means, buy the safety gear and take a minute to put it on. Now the question I have for you is, did I just buy a bunch of firewood, or did I get some good project wood? Here we can use the power of the Internet to bring together two resources, this supply of apple wood, and the combined knowledge and experience of the people reading this. If you've worked this kind of wood (either the apple or the cedar), I'm looking for suggestions on what to do and what not to do. Let me learn from your wisdom and your mistakes! What should I do to dress this wood? Should I split it with wedge and froe? How small? I can get it down to eighths easily. Should I flitch-cut it with the chainsaw, bandsaw, or handsaw on a sawbuck? I've done the latter with 8" birch after it sat in my garage for months; hard work, but not impossible. Should I work it as soon as possible, or let it season some more first? Where and how should I store it, outside or basement? Stacked and stickered? What kind of projects would this wood be good for? Any particularly good uses for quartersawn (or quartersplit) stock? Can the apple be used for plane bodies if I sticker the splits for a few years? Working this kind of wood is a bit of an art and mystery. It looks like it can be unpredictable with all the knots. I have books on green woodworking and green turning that mention apple, but not a lot of detail on using apple specifically. Larry told me his neighbor had tried to make something out of a nice straight section that had been seasoning for a while, but not long after he cut it, it twisted all out of shape. So it still had a lot tension bound up in the fibers. The other reality is that I don't have a lot of time available to work this wood if it turns out it needs to be used quickly. Worst case, if it becomes unusable, I can just burn it in the fireplace. But I'm hoping to do better than that. That looks extremely interesting. Unfortunately, I can't give you any input, but I will follow the discussion closely, because I (hopefully) will be in a similar situation - I know of an orchard with apple and cherry trees, where some of the trees will be put down. I'll be the first to answer one of my own questions, and I'm psyched! I'm reading John Whelan's books "The Wooden Plane, Its History, Form, and Function" and "Making Traditional Wooden Planes". In both, he mentions applewood as one of the primary woods for English and American plane bodies after beech. In "Making", where he built all of the planes he described, about half of them are apple. They are a mix of the bench and moulding types, so that's very encouraging. Everthing is quartersawn, to make the rings parallel to the plane sole. He says that for commercial production (you know, 100 or 200 years ago), blanks were rough sawn and then air dried for one year per inch of thickness, with some mention of debarking. Looking at the ECE PDF "Complete Book Of Woodworking Tools", they cut their blanks from just inside the sapwood line. 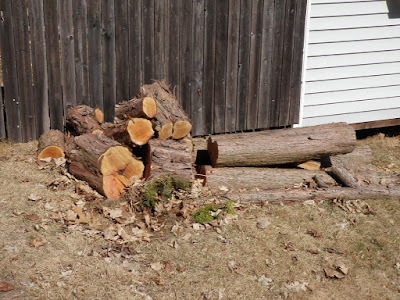 So I think if I quarter or eighth these logs, rive off the sapwood and pith, then roughly square the sides with a drawknife, I'll have blanks that I can stack for several years in the basement. This is clearly a long-term project! Since this is basically the procedure Langsner shows for making chair parts, this should give me some good use out of my shaving horse. Or maybe I'll need to do a little sawing to square them up. I'll start a seasoning pipeline. I'll date the ends of the blanks and add a new generation each year, as long as I can continue getting wood from Larry. Once the first batch is ready to work, I'll have a continuous supply of blanks. Still wondering if I should seal the ends. I assume I should leave the blanks long so that any checking can be trimmed off when ready to use. That's one use for this wood, what else? Steve, I've made two planes with applewood. It's great to work with and holds an edge well, but it moves a lot. I would let it season for a few years before making a plane with it. If you can cut the applewood quartersawn, that should help. I seal the ends with latex paint, but that's a good idea to cut the blanks oversized both in thickness and in length so you have plenty to trim once they're seasoned. Applewood would make nice tool handles or anything for which you would use cherry. Often you'll find wood with knots that can be used as part of a design in boxes. Once you cut it with an tool, see if you notice the smell of cider. It's just another pleasant benefit to working with this wood. That is correct about the orchards moving toward dwarf trees. They don't take up as much room and they produce more apples than the larger trees. There will be a day that we can't get wide apple boards. I would flitch cut it... Not that I know anything about apple wood but would love to have a few peices like you have there and try a few things! So i would flitch cut the longer, clearer one and try to get the middle part(quartered) in 3" thick for a few hand planes!! You are so lucky!! Is there any interest from folks in making pieces available for sale? I do see other people selling boards and turning blanks online. I'm not looking to make a bunch of money, just a some return on my time and effort as I spread the goodness and let others try some of this. A small boutique business that helps make the hobby pay for itself. I could model it on wine vintages. Would you like a nice piece of 2010 cortland to go with your meal? After I saw or split them and seal the ends, they'll go into stacks for a few years. I could start at a base price per board foot (144 cubic inches), then add to the price per year of seasoning, like aged Scotch. Buy this year if you want green or you want to let it season in your own personal hoard, or in a couple years if you want it already seasoned. I can make some pieces available each year while maintaining a reserve. Whatever doesn't get sold, I would use myself, so it's not a big deal either way. There are enough online selling tools that it's easy to do. USPS flat rate shipping boxes are easy to use, cram in as much as will fit. They can even ship internationally, although that starts to make for some expensive wood. I sure would be interested in a few chunks of quarter sawn 4"x 4"x as long as you can fit in one of those boxes!I'll take green! Let me know what you can do, there is my zip 99840. That does look very interesting. I have some oak and maple in similar condition. The neighbor cut down some huge oaks that have been around since about 1870. I dragged and rolled as much as I could across the street before the potbelly stove enthusiasts got their mitts on it. 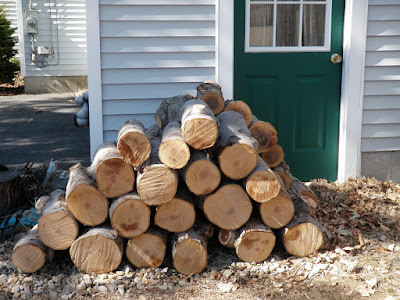 I've stored the logs, about 8 - 12 feet long and 12 + inches in diameter, in a crisscross fashion, kind of like lincoln logs, three logs high, and under some blue tarp to keep them dry from the constant New England rain. They've stayed there for about 2 - 3 years while I try to figure out how to manhandle the damn things into workable boards. Also took down a maple in my own yard last fall--in my neck of the woods those maples are like dandelions, but this one is a big dandelion. Saved almost the entire thing. I'd be interested in trading if you're game. And will show me how you do yours first! 1 Spoons right away - rive to manageable size. Smaller bits work well too - you can keep the twist and build into the spoon. See Saint Roy. 2 Bowls -check Robin Wood's recent post. Will take some searching among the HCA stuff. And prepare and store with painted ends. See Steve Russell for paper bags. 3 debark, split and store some of the bigger bits so you can get boards later. Tends to be very gnarly and difficult. While watching the videos I also stumbled onto one on green woodworking from Mike Abbott at http://www.youtube.com/watch?v=X-X0gx4G9qc. These guys are both going on my links list. 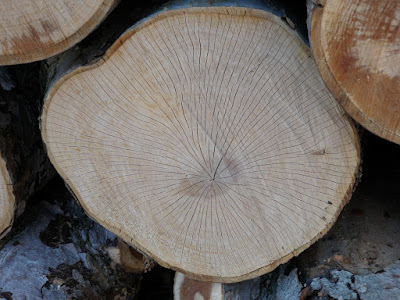 I recently stumbled across DOE Orchards' pile of apple logs, and although I am pretty spooked by the prospect of obtaining boards, I am considering getting some for future wood turning projects. Do you have any additional thoughts on the subject one year later? Thanks. The pieces I sawed into small boards have experienced pretty significant warping and cracking. I've heard that about apple, plus I just stacked them in my basement and ignored them. Someone skilled at managing the drying process might get better results. It's still usable, just not as full size boards. The pieces I split or sawed into thicker blanks fared better. They have some end checking, but not too serious. I still have some unsplit pieces outside. The ends have checked in the sun. However, I tried splitting a couple with the froe, thinking the cracks would make it easier, but they were still solid once I got the edge in a half inch. So I think you could easily get decent turning blanks out of it. For other projects, you may end up going through a lot of waste to get usable stuff.